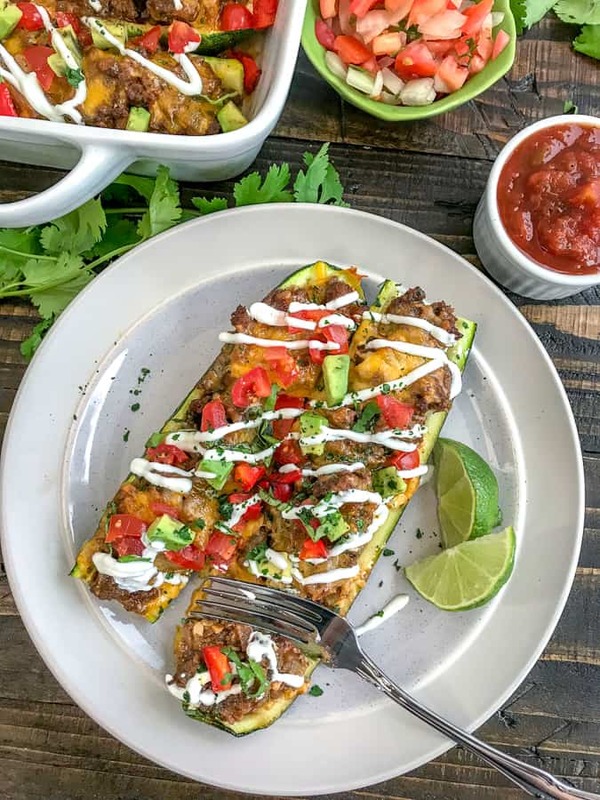 These easy, cheesy Taco Stuffed Zucchini Boats are a great meal option if you’re looking to enjoy a healthy, low-carb Taco Tuesday and are also a delicious way to ensure your family gets an extra dose of vegetables! Only 165 calories per boat! 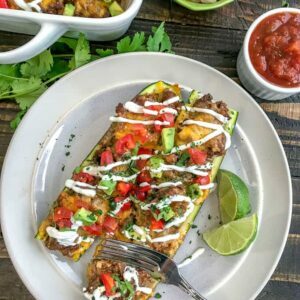 Each zucchini boat is loaded with flavorful ground beef, seasoned to taco perfection and topped with melted cheese, avocado, tomatoes, and plain greek yogurt. Guarantee you will love this recipe! One thing I will never deny is how much I love anything taco related. If you follow me on Instagram, you are more than likely nodding your head in agreement. Naturally, it’s still a “new year” to me and my husband. We told ourselves that we would do our best to get back on track and stay on track after the holidays derailed us. We enjoyed ourselves, but still made time for the gym. All about balance, right? 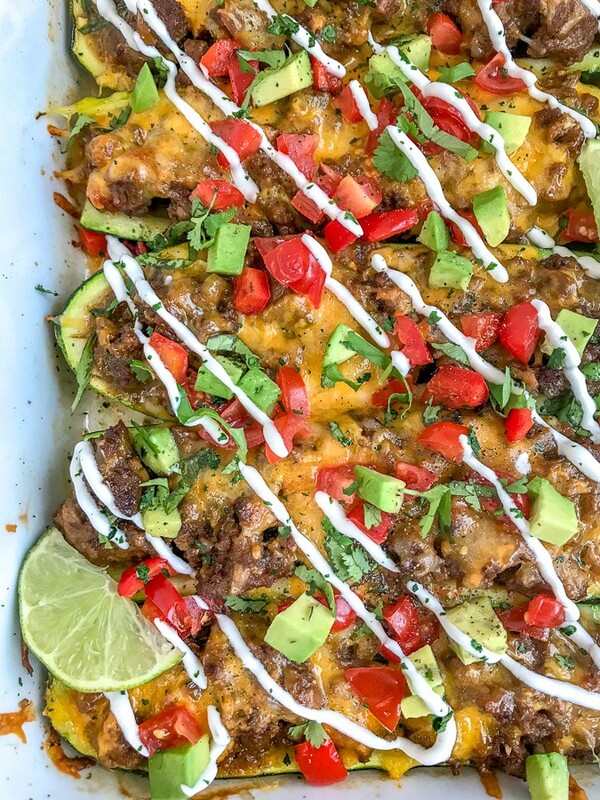 If you have tried my Loaded Skinny Taco Flatbread Pizza or my Chicken Taco Lettuce Wraps, then you will love this recipe, too! Cut each zucchini in half lengthwise and hollow out the center of each using a small spoon. Place a large nonstick pan over medium heat with olive oil. Sauté onions and garlic. Add the ground beef and break it into very small crumbles as it browns. Season and continue cooking. Add green chilis and your favorite salsa. Divide the taco filling among the zucchini boats, pressing down firmly, filling from one edge to the other. Sprinkle cheese overtop, cover, and bake 20-25 minutes. Garnish with chopped tomatoes, avocado, plain greek yogurt, and freshly chopped cilantro. A fresh squeeze of lime juice is lovely, too! I recommend scoring (cutting lines into the surface of) the centers of the zucchinis prior to scooping. I find that this helps to make hollowing them out easier, as well as to avoid tearing the zucchini apart in the scooping process. It’s easier to stuff the boats if the ground beef/meat is broke down into very small crumbles. Firmly press down on the beef mixture after you stuff each one from end to end. It’s ok if they are heaping. 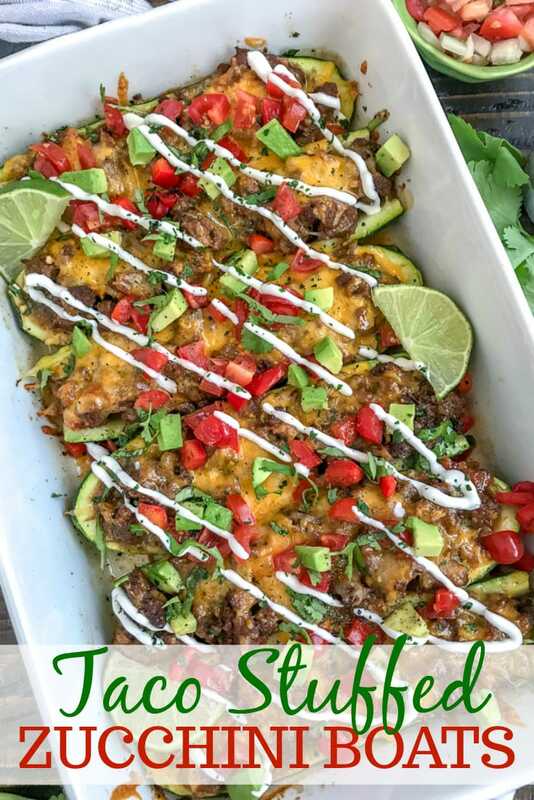 Then it’s ‘loaded zucchini nachos’, right? HA! Cut back on time crumbling the ground beef. Score the meat with a knife while it is still in its packaging (plastic removed, obviously). This way it is partially broken up. Freshly grated cheese melted SO much nicer than pre-shredded! PULP: You can add the chopped pulp to the beef mixture while it is cooking. Add it after you sauté the onions and allow it to cook down. The pulp may release water. Simply drain or soak up with a paper towel. OR you can place it in a freezer-safe bag and save it to add to a smoothie! You won’t even taste it! 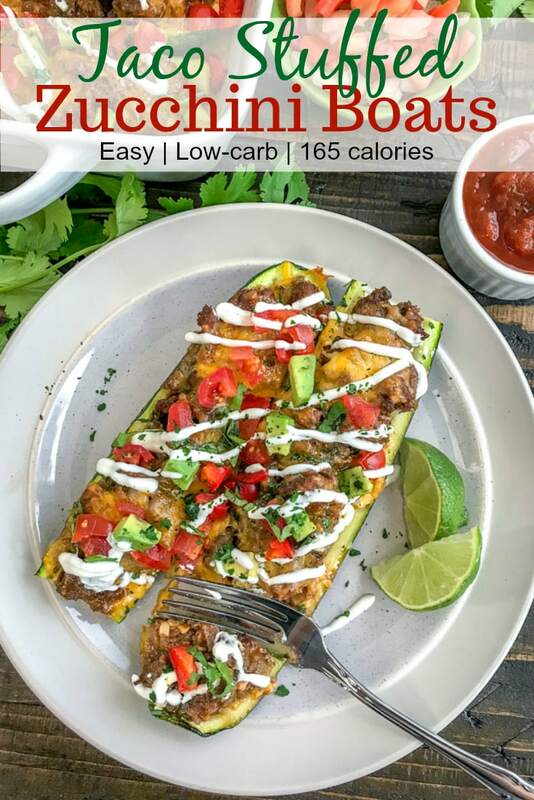 A delicious and easy way to indulge in taco night while staying low-carb, as well as add a few extra vegetables into your diet! Guaranteed to be a new family favorite. Trim the ends off the zucchini. Cut each zucchini in half lengthwise and scoop out the centers, leaving approximately 1/2-inch shell. Place each boat into a 9x13 inch baking dish, cut-side up. Place a large nonstick pan over medium heat with the olive oil. Once heated, add the chopped onions and sauté 3-4 minutes, or until translucent. Add the minced garlic and cook 30 seconds, stirring. Add the ground beef and cook until browned. Season with chili powder, onion powder, oregano, paprika, cumin, salt, and pepper. Stir to thoroughly mix. Add salsa and diced green chiles. Stir to combine. Taste test and adjust seasonings, to taste, such as salt and pepper. Spoon the beef mixture into each zucchini boat, pressing down to fill each one from end to end. Top with shredded cheddar cheese and a fresh squeeze of lime juice. Cover and bake for 20-25 minutes, or until the zucchini is fork-tender. Remove and garnish with diced tomatoes, avocados, chopped cilantro, and plain greek yogurt. Or your favorite taco toppings! It's easier to stuff the boats if the ground beef/meat is broke down into very small crumbles. Firmly press down on the beef mixture after you stuff each one from end to end. It's ok if they are heaping. 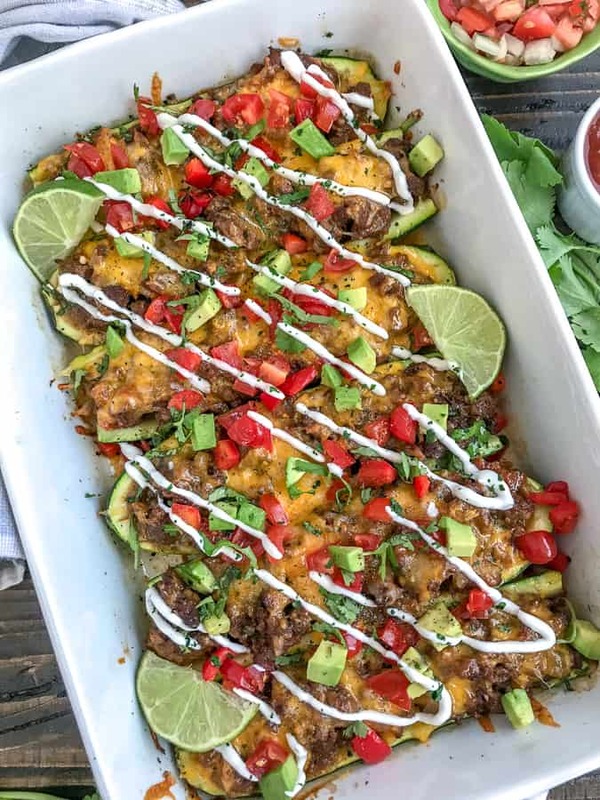 Then it's 'loaded zucchini nachos', right? HA! PULP: You can add the chopped pulp to the beef mixture while it is cooking. Add it after you sauté the onions and allow it to cook down. The pulp may release water. Simply drain or soak up with a paper towel. OR you can place it in a freezer-safe bag and save it to add to a smoothie! You won't even taste it!